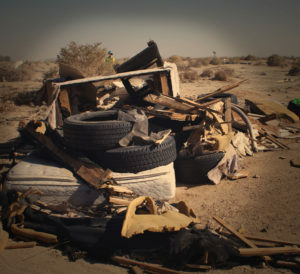 WHAT CAN YOU DO TO HELP KEEP THE ANTELOPE VALLEY FREE OF ILLEGAL DUMPING? YOU CAN GET INVOLVED BY VOLUNTEERING FOR CLEANUPS, TALKING/WRITING TO COUNTY OFFICIALS, AND REACHING OUT AND EDUCATING OTHERS ON THE COSTS OF THE PROBLEM. SHARE YOUR PHOTOS OF ILLEGAL DUMPING DISCOVERIES WITH #DEHSART ON FACEBOOK. JOIN THE CONVERSATION. Reconsider waste as a resource. Is it possible to reuse, recycle or re-purpose the item/s? Take your used motor oil and other household hazardous waste (HHW) and electronic waste (E-waste) to proper collection facilities. Visit the HHW/E-waste website for a list of free locations and collection events. Support recycling programs in your community. Visit the Residential Recycling and Business Recycling websites for more info. Bulky items, such as furniture, large appliances, etc., can be collected by your waste hauler, if you make arrangements, right from your curb, often for little or no costs. If you can’t donate useful items, make sure you dispose of them properly. Tires illegally dumped are a significant problem in the Antelope Valley. They can catch fire and are a haven for mosquitos. Please recycle your waste tires! Find out how on the Waste Tire Recycling website. Free solid waste disposal services are available through the Lancaster Landfill, (PDF, 31KB) Waste Plan Conformance Agreement. Utilize illegal dumping prevention programs, (PDF, 26KB). Meetings are free, informative, and open to the public.